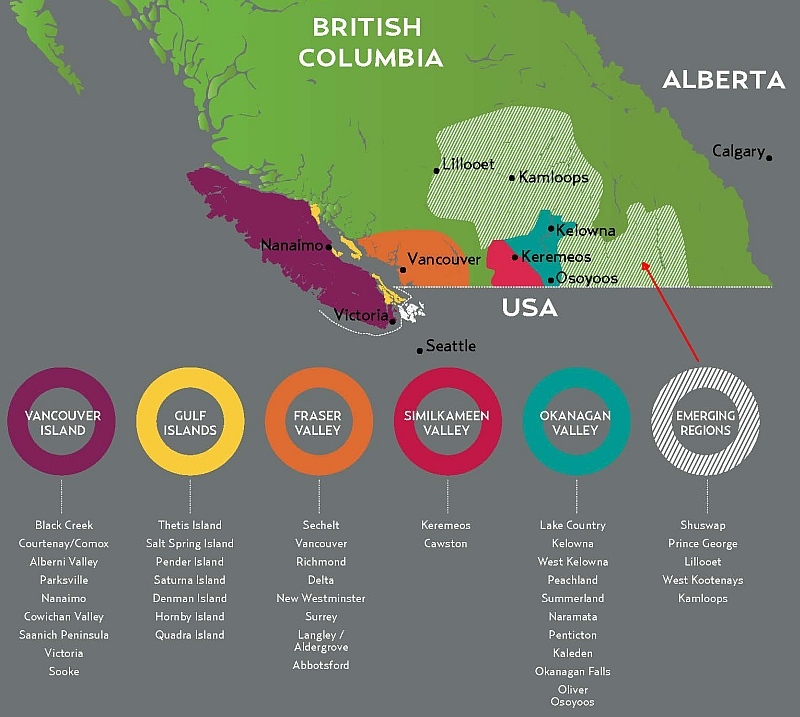 Do You Know About BC’s Emerging Wine Regions? by mywinepal • July 13, 2017 • Comments Off on Do You Know About BC’s Emerging Wine Regions? Everyone knows about the Okanagan Valley as a wine region, and some may also know about the Similkameen which is on the southwestern edge of the Okanagan, but what about BC’s emerging wine regions, covering the Kootenays, Lillooet and Thompson Shuswap? 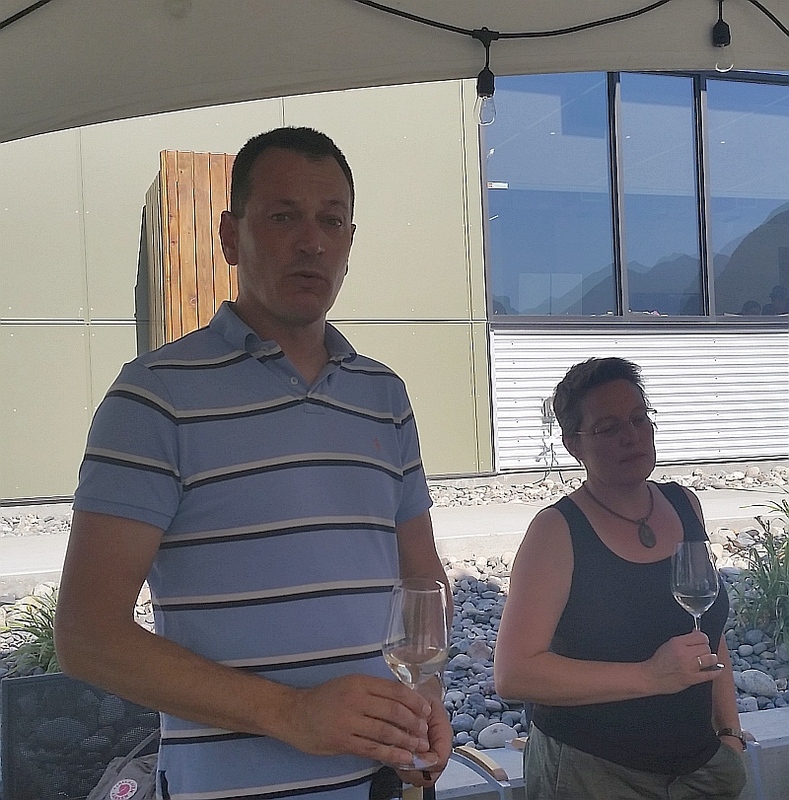 I had a chance to go on a trip hosted by the Wines of BC to visit Lillooet and the Thompson Shuswap. If you haven’t a clue where these areas are, this map from Wines of BC outlines it for you. These regions are “emerging” as they have marginal climate for growing grapes, but with the ongoing change in our climate, some vitis vinifera and hybrid grapes can survive the winters and can ripen in the shorter growing season. Although these regions can get quite hot, e.g. it was 38.5 degrees Celsius in Kamloops one day that we visited, the evenings do cool off and the growing season is compressed compared to the Okanagan. The wines from these regions I feel are best represented by their vibrant, acidity backed, fruit forward white wines, although the wineries also do grow some red grape varieties like Pinot Noir, and make sparkling wines. The wineries are all easily accessible by car from Vancouver, and you could consider visiting one or more for a weekend trip. One thing that I enjoyed about many of these wineries is that they also have a restaurant associated with the winery so that you can sit on their patio, with food grown nearby, and paired with their wines. 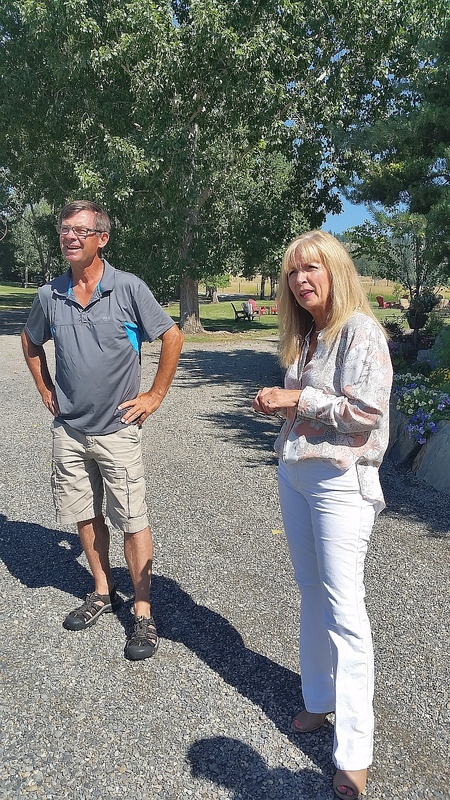 Arrowleaf Cellars, Fort Berens Estate Winery, Harper’s Trail Estate Winery, and Monte Creek Ranch Winery currently offer wine and food for your enjoyment. In Kamloops, as shown in the map, you can see 3 wineries located together to make an easy trip. There are accommodations in Kamloops, as well as many restaurants, such as Terra Restaurant, where we had a multi-course dinner with Tourism Kamloops, Monte Creek Ranch, Harper’s Trail, and Privato Winery. The food, again local if at all possible, was prepared very well, and we enjoyed dishes such as Beet salad, Salmon with risotto, Lamb chops and duck confit cabbage roll, and Cherry chocolate cake. Indigenous is important. We all know that Nk’Mip is BC’s first indigenous winery. 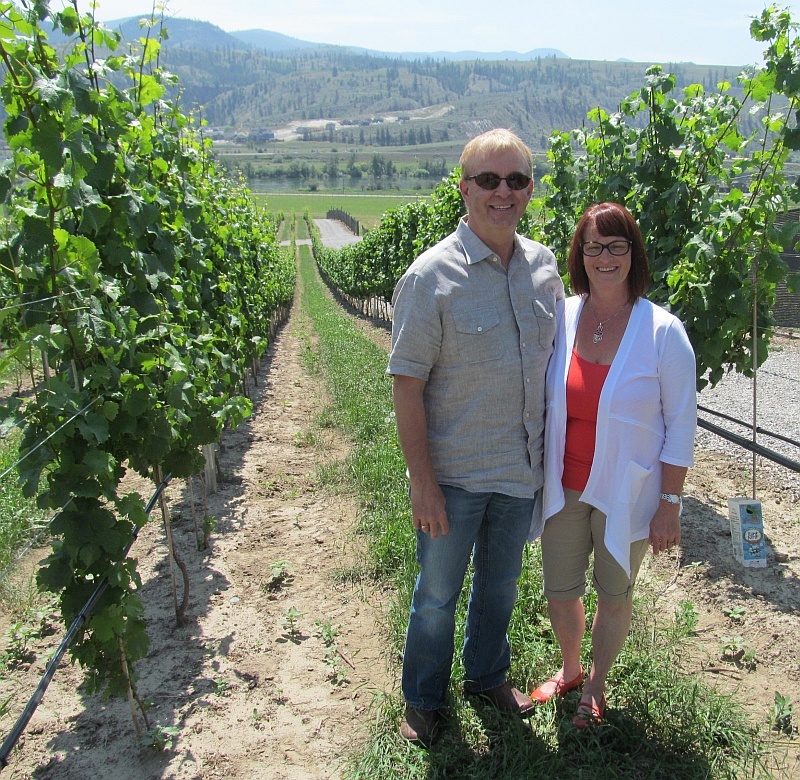 There is also Indigenous World Winery in Kelowna, but there is also Lavina Estate Winery in Salmon Arm, which you may not have heard of before. We were able to taste Lavina Estate Winery’s wine and the wines from Celista Estate Winery and Sunnybrae Vineyards (all located near Salmon Arm), while we enjoyed an indigenous inspired dinner at the Quaaout Lodge Resort & Conference Center located beside Little Shuswap Lake. This indigenous-owned resort, offered us dishes of Three Sisters Salad (made with corn, beans, and squash; important to their culture), Elk Scallopini, Bannock, fruit tart, local cheeses and berries. 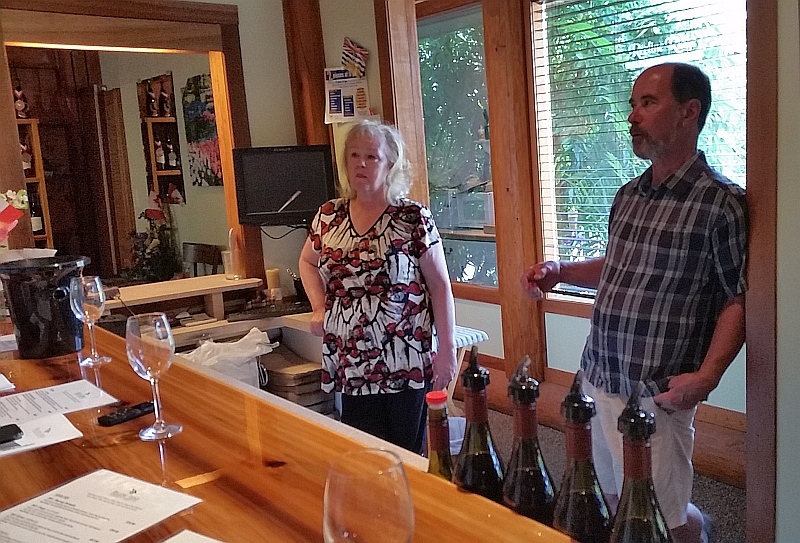 Although I have not yet gone into detail about each winery, many of the wineries are run by a husband and wife team. Each couple have a love for their land, their vines, their wine, and wanting to share their experiences with us all. Seeing their dedication makes you appreciate their wines even more. Claude and Cindy from Lavina Estate, and Marg and Jake Ootes from Celista Estate are also couples, but I did not have pictures for them. In my next articles, I will offer some background and insights to these wineries and give you some of my favourite wine picks. Some of the wines you will be able to purchase through the BCLDB or specialty wine shops, while other wines you will need to order directly from the winery. I hope I have enticed you to consider a trip to visit this emerging wine region in BC and trying their wines. Enjoy!